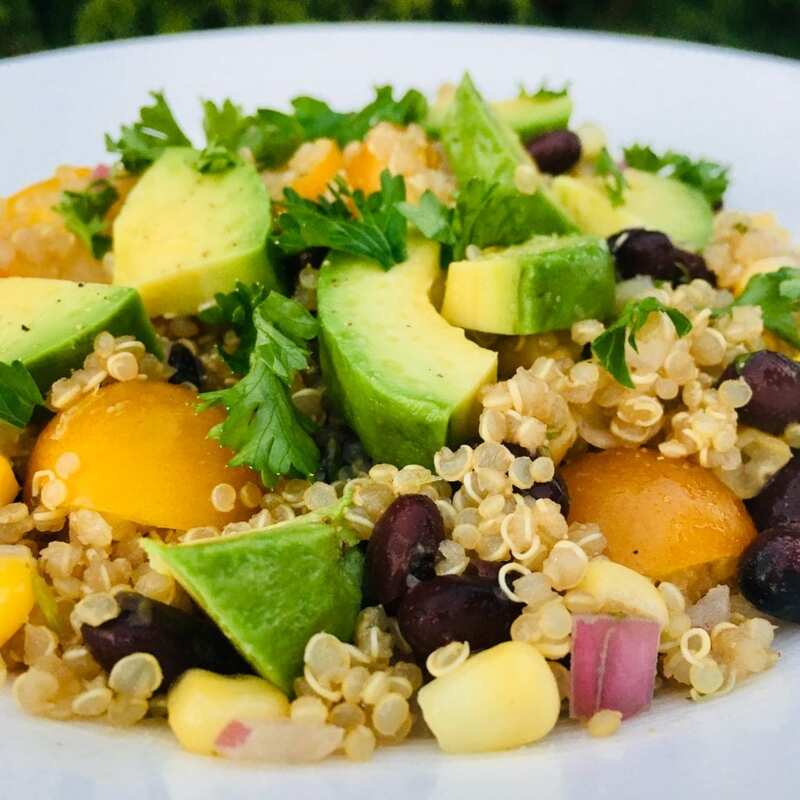 This killer quinoa salad is a surefire hit at a potluck (or at home! ), and is easy to make, with simple ingredients. It serves up a nice combination of tanginess (thanks to the cilantro & lime), sweetness (corn and tomatoes), and creaminess (avocado). Nutritionally, this dish is ‘on point’ when it comes to good fats, proteins, and iron, and is a superstar when it comes to fiber. For those seeking lower carb intake, simply dial back the quinoa, or serve the bean mix on greens (or solo). 1. Cook 1 cup quinoa with 1 cup of veggie broth and 1/2 cup water according to package directions (~15 min). 2. While quinoa is cooking, prepare the rest of the ingredients. You can play around with the ratio of quinoa to bean goodness. We usually mix together roughly equal parts quinoa and beans mix. You could also prepare a bed of quinoa, and put the bean mix on top, or eat just the bean mix (lower carb option). * The Percent (%) Daily Values are based on an average adult, who needs approximately 2,000 calories and do not represent the needs of children. Furthermore, they are not 100% accurate because the recipes have not been professionally evaluated nor have they been evaluated by the U.S. FDA. If you want to get fancy, try her cilantro dressing. We find that our simpler version still hits the spot. PS Those with keen eyes will note that I sprinkled parsley on top to spruce up the photo. I highly recommend cilantro rather than parsley for the actual recipe!